WELCOME TO THE NORTHEAST PENSACOLA WILDCATS HOMEPAGE! NEP Juniors 14U team pulled off an upset of No. 4 seed Pensacola Tigers 16-6 on Saturday in Milton. NEP Wildcats 6U squad edged Brent 20-14 to cap off unbeaten regular season. The Northeast Pensacola Wildcats captured championships in the 7U, 8U, 9U and 11U age groups. 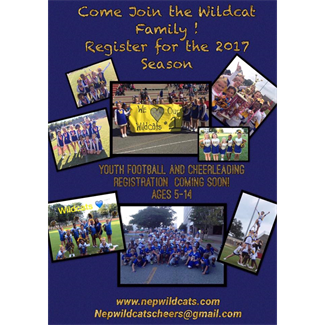 NEP Wildcats sending four teams to the NWFYSA championships this weekend at Milton High School. Support NEP with Amazon Smile!